I told you it was going to be a couple weeks of travel blog posts. I essentially went from Des Moines, IA to Washington D.C. with just two days off at home in Kalamazoo. My colleague and I had to drive to D.C. It’s about a 10 1/2 drive from Grand Rapids. It’s not a cake walk but it’s not a bad drive either. The best thing about driving that route was that we were going to be going around Pittsburgh. Sure…we could have skirted around it on the highways that bypass the city, but I had a better idea. Lunch at one of Pittsburgh’s most famous restaurants. 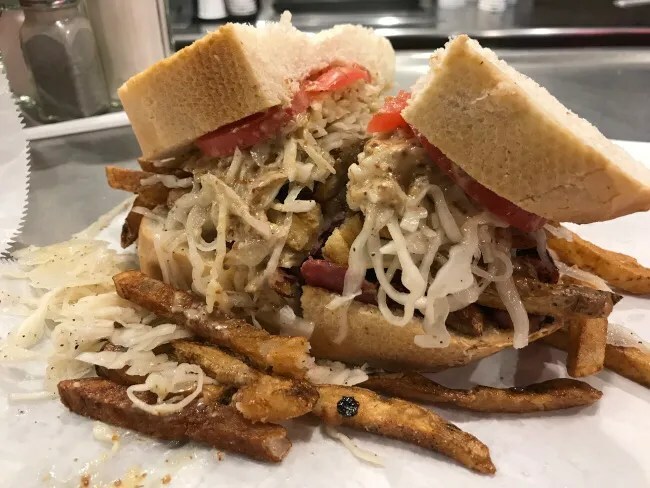 If you’ve watched any travel show about Pittsburgh or any show about great sandwiches in the country, you’ve heard of Primanti Bros. I have never had a reason to go to Pittsburgh before but now that I had one, I wasn’t going to pass up the opportunity. 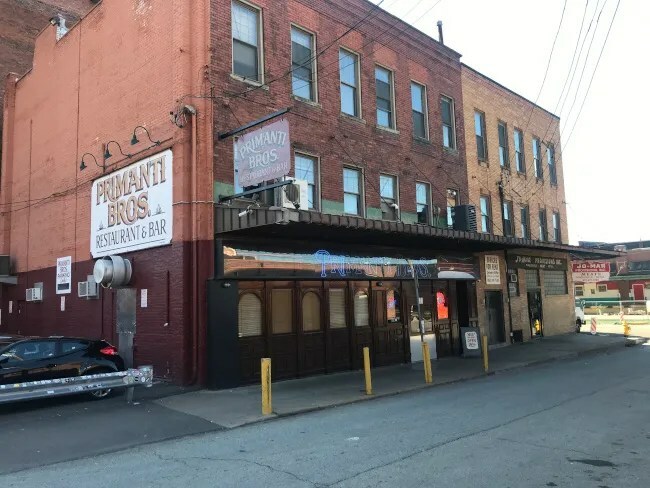 The original Primanti Bros. location is in The Strip District on 18th Street. The Strip District runs along the Allegheny River. It’s populated by converted warehouses and has become kind of a hip area. 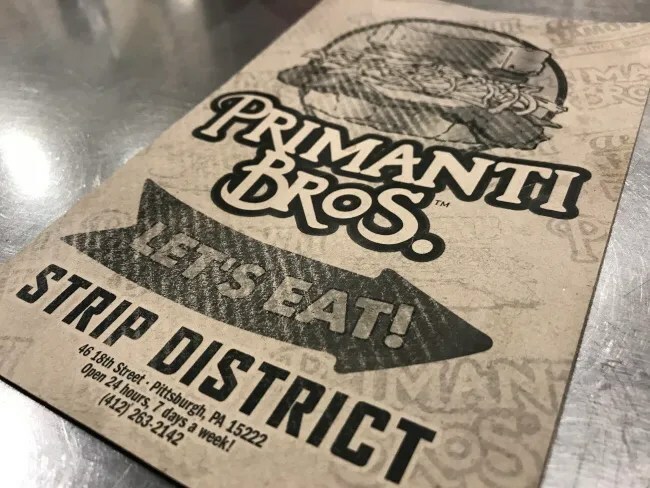 Primanti Bros., however, has been there long before that happened. The shop was set up in the early 1930’s when the surrounding buildings were still actually used as warehouses. We rolled in to Pittsburgh just before 4:30 on Wednesday afternoon. There was plenty of street parking right in front of the building. There’s also a lot right next to restaurant but there are signs that say it’s permit parking despite other signs that say Primanti Bros. Parking Only. I really had no idea what I was expecting when we walked in. I was kind of under the impression from watching on TV it was dark pub with an old wood bar. That’s really not the case. It’s more of a diner set up with a large stainless steel lunch counter that runs the entire length of the dining space. The food is cooked on a flat top behind the bar and large signs highlight menu items. There’s also a few tables in the remaining area. 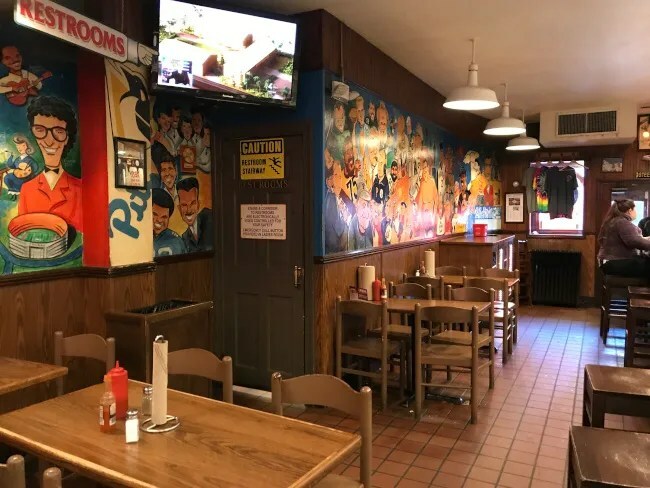 The walls are covered with a hand painted mural featuring famous sites in Pittsburgh and people who have eaten at the famous diner. My picture of a dark pub was totally off. They do serve beer but this is much more of a lunch counter than a bar. My co-worker and I both ordered Coke’s to drink. We still had about five hours to drive so beer wasn’t a good idea. As the waitress was grabbing the drinks, I walked down to the end of the counter and grabbed a couple of the paper menus. 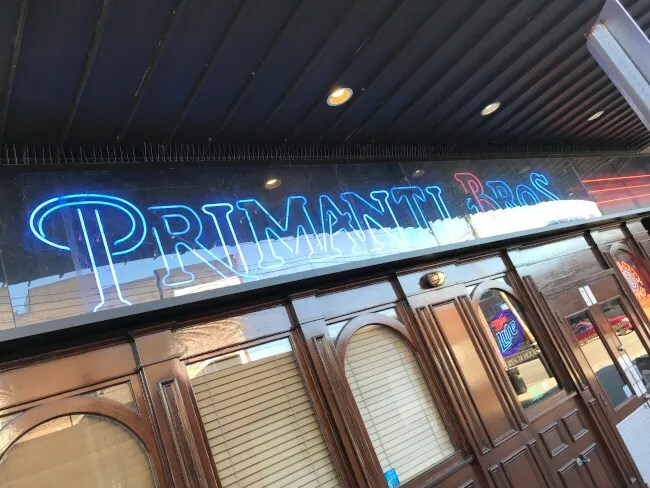 My colleague had never heard of Primanti Bros. before so even though I had a good idea of what I wanted, we needed a few minutes. I actually started with an order of fries even though (SPOILER ALERT) there are fries on the sandwich. 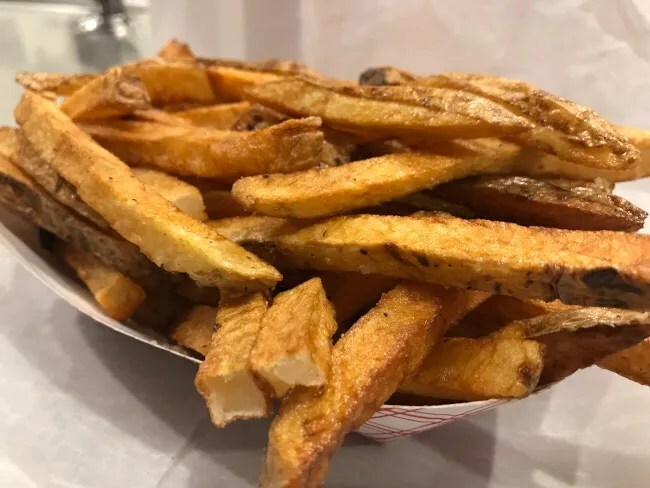 The fries are hand cut and fried to that delicious golden brown and slightly greasy way that I love fries. I shared some of these with my co-worker because I knew the sandwich was going to be more than I could handle. The sandwich I picked was The Carnegie. This sandwich is pastrami, corned beef, Swiss cheese, and Spicy beer mustard in addition to the fries, cole slaw and tomatoes between two slices of thick French bread. The fear with a sandwich like this is that it will be more slaw than meat. That was not the case. The sandwich would have been a substantial sandwich without the fries and a slaw. There was a large pile of pastrami and corned beef underneath the mess of toppings. I’m not usually a slaw person but I figured I had to eat this sandwich the way it is intended to be eaten. I mean, if I didn’t, I wouldn’t be eating a Primanti Bros. To my surprise, the slaw was actually very tasty. It’s a vinegar based slaw so it had a little bit of a spiciness to it. The fries stayed nice and crispy in the first half but by the time I got to the second, they had gotten soggy and brought the sandwich down a little bit. It’s best to eat this sandwich as quickly as you can after you get it. My bill for this sandwich and fries was just a little over $15 before tip. Primanti Bros. was everything I had hoped it would be. It’s been called one of America’s Best Sandwiches over and over again and there’s a reason for it. It’s such a unique idea and the sandwich really works despite looking like a total mess. 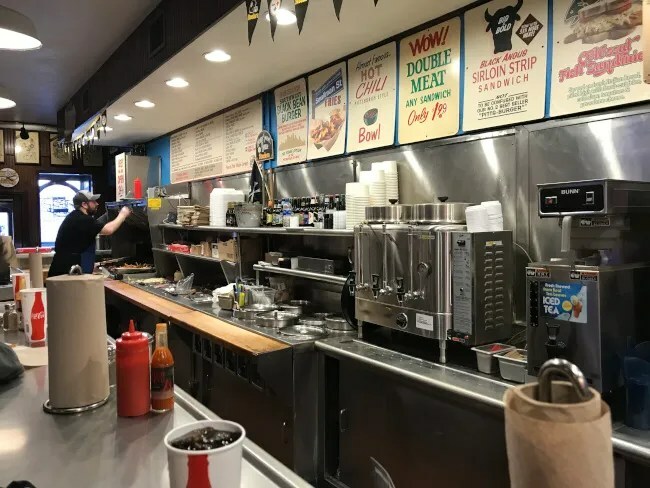 This location in The Strip District in Pittsburgh is the original location but franchises have started popping up the last several years including restaurants in Novi and Taylor. 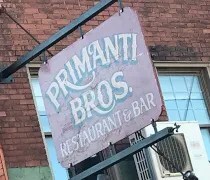 If you really want the true Primanti Bros experience though, you have to go to Pittsburgh and find this old warehouse on the corner of 18th and Smallman.